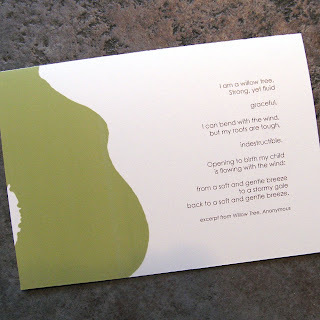 Another of our newest custom designs: an invitation for a mother blessing / baby shower. The idea for this design was to convey that this event was about celebrating the mom-to-be, and this important transition in her life. We selected a poem, entitled "Willow Tree" and set it against the curve of the woman's stomach. 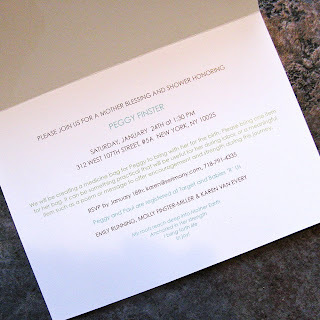 Inside, we utilized the soft green, a bright turquoise and brown text, and the envelope was a matching soft green with brown text. Next up: the birth announcements once the little boy arrives!